Find Better Ideas, Faster ® with a custom ring trend report, our PRO Dashboard and 80+ categories of premium trend reports. The Ring Trend Report explores the latest ring designs, from the classic diamond wedding band to unique vintage rings. 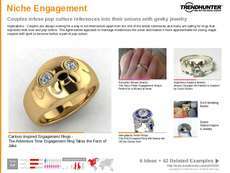 Rings continue to be one of the most traditional pieces of jewelry; however, in recent years there has been a surge in unconventional wedding rings, as consumers look to distinguish themselves in matrimony. From our crowd-sourced research, businesses can gain insight on how white gold, the princess cut and more are being adjusted to capture consumer attention. 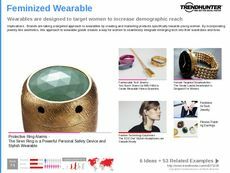 Whether you sell rings online, own a jewelry store or are a jewelry designer, the Ring Trend Report is ideal for inciting product development and marketing strategies for this compelling accessory. 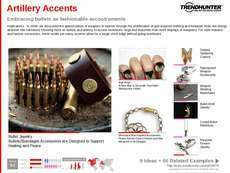 Jewelry is constantly changing according to economic stability, and the Ring Trend Report examines how these changes affect ring designs and product marketing.